The traditional Garden of Gethsemane on the western slope of Mount Olivet. This is the traditional Garden of Gethsemane where Jesus prayed to the Father prior to his arrest, trials, and crucifixion. The Temple Mount is visible from this location. Photo by Ferrell Jenkins. If Jesus was not at this specific spot, it could not have been far away. For the full account read Mark 14:32-46 and Matthew 26:36-46. 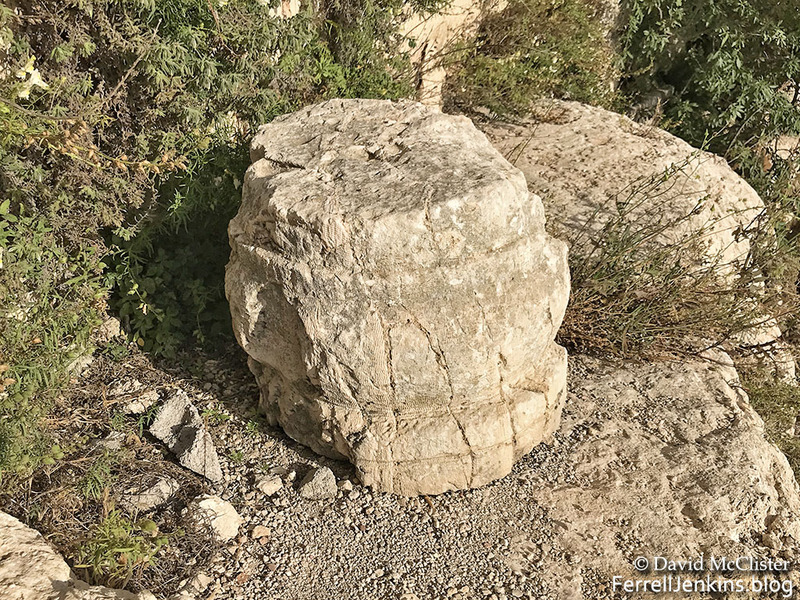 This post is a sort of addendum to the two previous posts on the Walls Around Jerusalem National Park. David McClister, head of the Biblical Studies department at Florida College, and I have discussed what we called the Shimon Gibson Site several times in the past few years. We corresponded after he was on his way to Israel for a tour. I was aware that I needed better photos for a couple of points of the discussion about the possible location of the judgment seat at a place called The Stone Pavement and in Aramaic Gabbatha. You may want to glance over the two previous posts to understand the importance of these photos. From Israel, David sent me the photos I needed. My photos did not show clearly enough the rock formation where Gibson thinks the bema where Jesus stood before Pilate was located. The site was included in my photos, but not as clearly as I wished. On one of my photos I had marked the place of a pavement that once covered the area. Remember that archaeology is a systematic destruction. In order to reach the level below the pavement, the pavement must be removed. In this case a few paving stones remain to be seen. The next photo more clearly shows the area of the judgment seat or bema. Gibson thinks this matches the descriptions given in the Gospel accounts. A couple of steps remain. The thought is that the Prefect would set up a canopy and judge from this place. 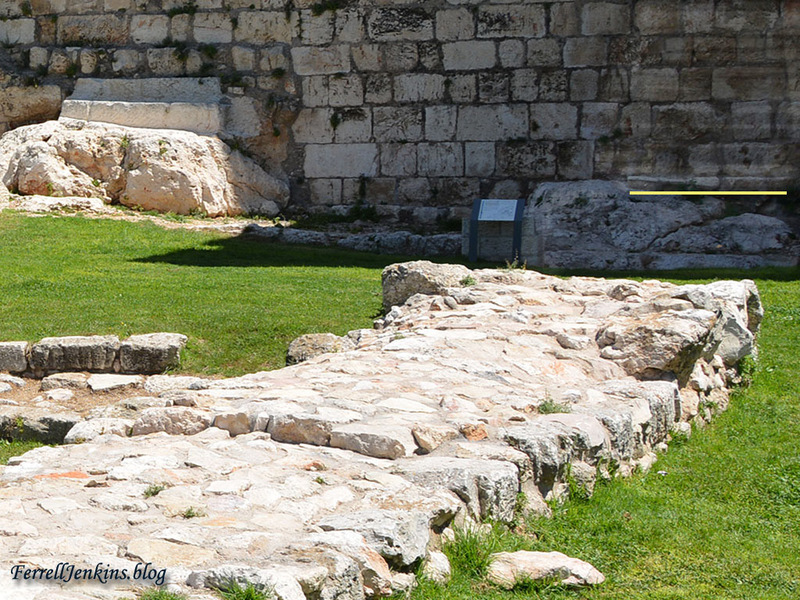 The natural platform where Gibson contends Jesus stood before Pilate. Photo by David McClister. To the south (right) of the steps we see in the photo above, there is what looks like a column base that Kramer says was found near where the young lady is standing. This stone does not have a cup in it as we will see at Dan, but it may have held a post of some sort to support a canopy. A carved stone piece that looks like the base of a column. Photo by David McClister. In lecturing to his group, Kramer reminds them of the podium at the inner gate of Dan where the king or a judge might sit to hear issues brought by the people . According to Avraham Biran this is where a judge or king could site under his canopy. The stone base, one of four, was used to hold one of the posts of the canopy. Photo by Ferrell Jenkins. A now-faded display sign at the gate of Dan illustrates what might have happened at this place. In a different incident King David is said to have taken his seat in the gate to receive the people. Sign in the gate of Dan illustrating the purpose of the podium that was uncovered there. Photo by Ferrell Jenkins. Carl Rasmussen includes a painting by Balage and a photo taken when a canopy was in place over the podium at Dan. 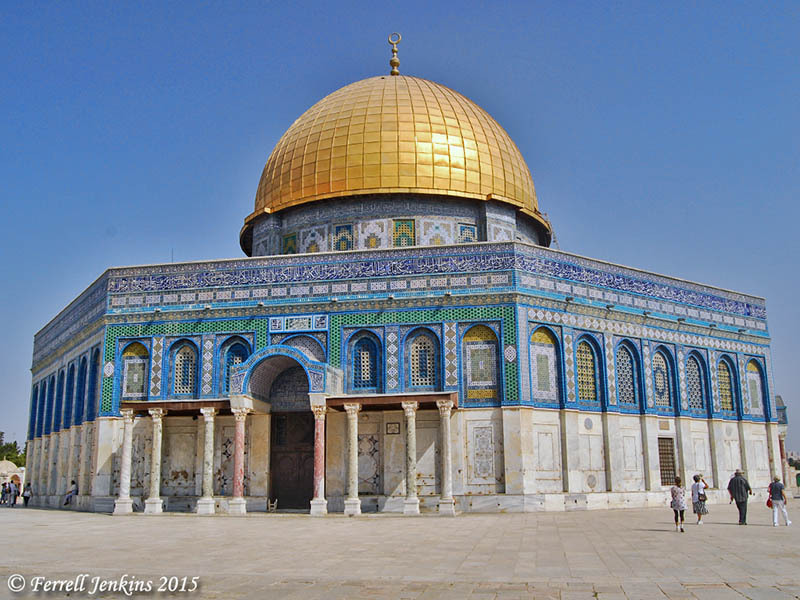 See his Holy Land Photos site. 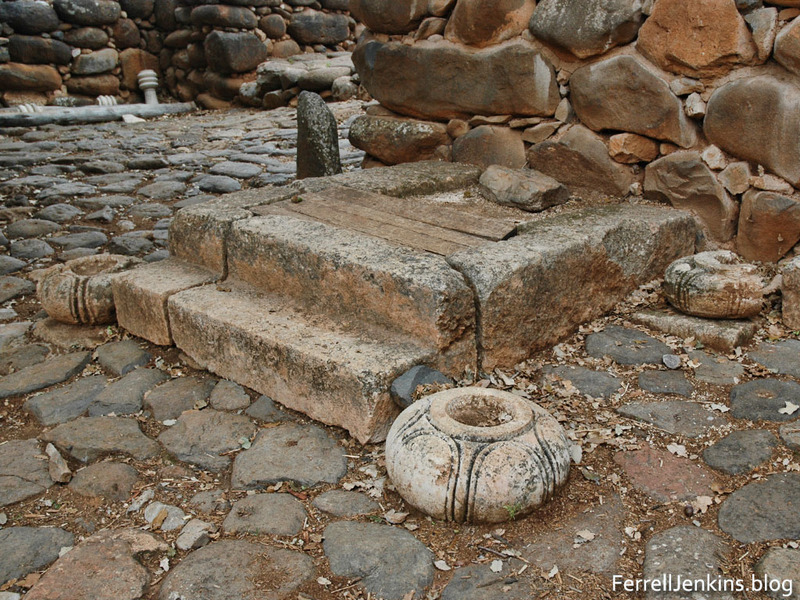 You will notice a difference in the bases where poles to hold the cover over the monarch may have been placed, but we are talking about two different periods – one from the Iron Age of Israel and the other from the Herodian Roman period. Hopefully these photographs will help us to understand more clearly what happened at this place. My thanks to David for his extra effort in getting the photos I needed. As we walk south in the garden, or along the paved path, we come to an area that looks like it might have been an approach to a gate with walls on either side. Against the Ottoman city wall we see steps but no gate in the wall. 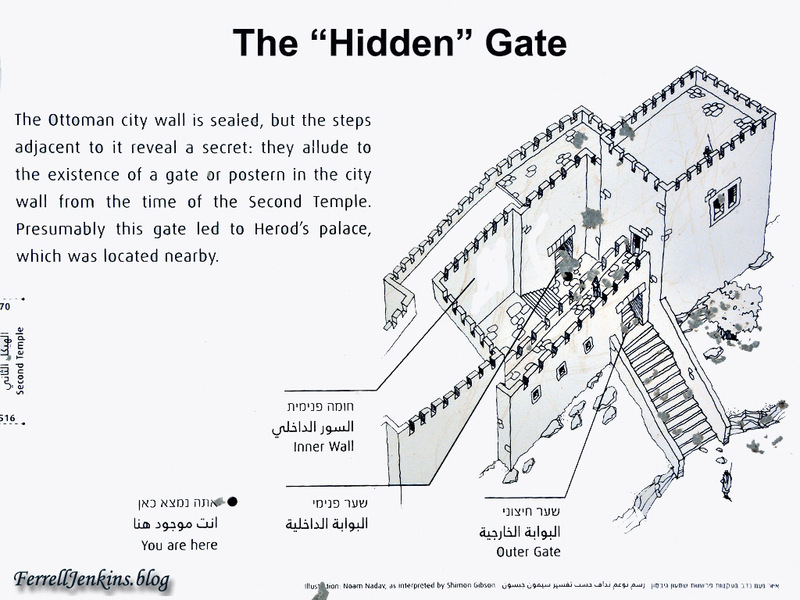 The sign at this part of the wall is labeled The “Hidden” Gate which Shimon Gibson thinks is the Gate of the Essenes. Recognizing that there are scholars who dismiss the Gospel account of the trial of Jesus, Gibson says there is reason to take a more positive approach based on recent archaeological evidence. Our photo below shows the gateway approach, the stone steps leading to a gate that is no longer there, and (to the left) a bema or sort of platform where a temporary judgment seat could have been erected. All of this area was covered with earth and debris before excavations were undertaken. The Herodian gateway approach to the Praetorium and Herodian palace. 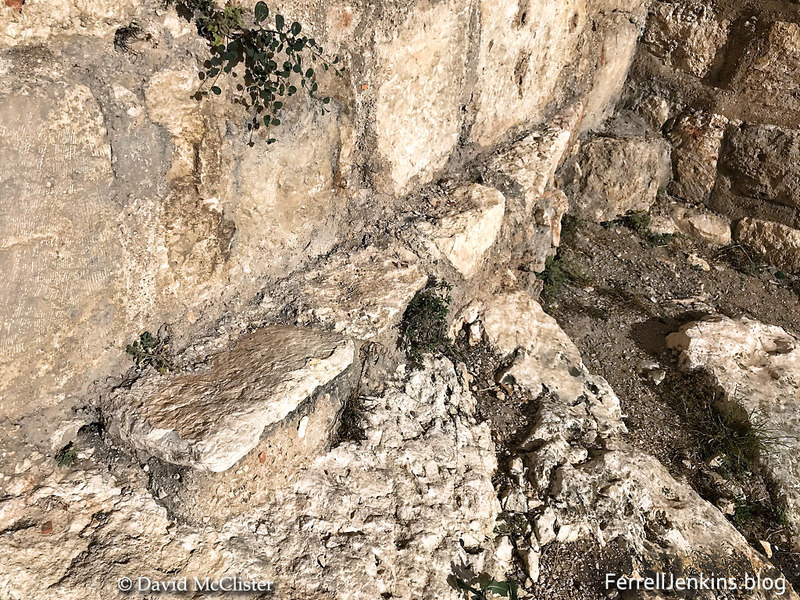 The bema or judgment seat is the large stone to the left of the image. Photo by Ferrell Jenkins. As we take a closer look at the steps cut into the bedrock and a jumble of stones of various periods built into the wall we realize that we need an illustration to help us understand what we have here. The Hidden Gate built on bedrock. Photo by Ferrell Jenkins. The sign at the site illustrates what has been found in the various archaeological excavations in the area. There was a gate here, designated as the “Hidden” Gate, which Gibson thinks was the Gate of the Essenes mentioned by Josephus. Sign explaining the “Hidden” Gate in the west wall of the ancient city of Jerusalem. Photo by Ferrell Jenkins. Several excavations have taken place in the general area both inside and outside the gate (see the references at the end of this article). The sources that I list at the end of the article have good drawings to show the location of Herod’s Palace and the Praetorium. The aerial photo below begins on the left (north) with the Citadel. As we move to the right (south) we have the area of Herod the Great’s palace, then the area of the Praetorium (now known as the Armenian Garden). The gateway which is marked with a yellow circle would have been the entrance to this area. Click on the image for a larger photo. Aerial view of the portion of the west wall under consideration. In it you will see the Citadel and the Armenian Garden. The place of the paved approach and the “Hidden Gate” is circled. Photo by Ferrell Jenkins. 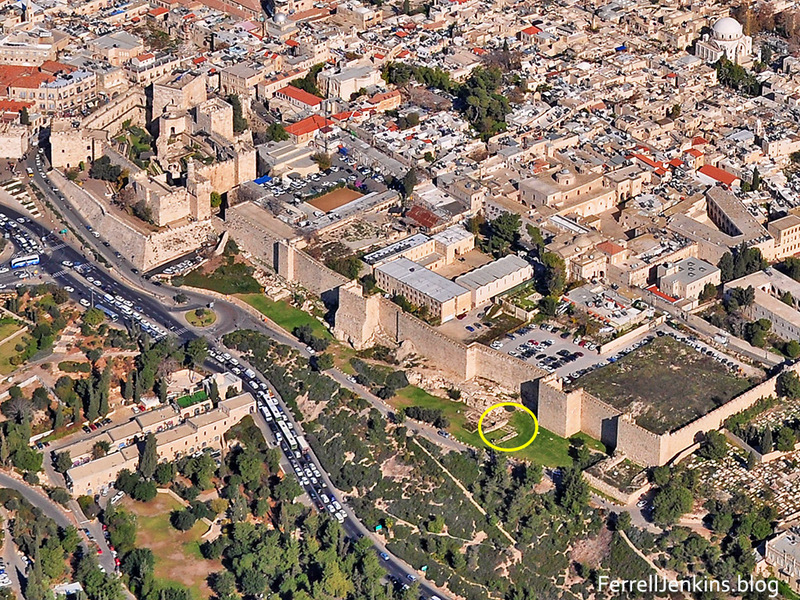 Here is another aerial view made from the southeast showing the entire area from the Jaffa Gate and the Citadel to the southern wall. Armenian Quarter of the Old City. Photo by Ferrell Jenkins. 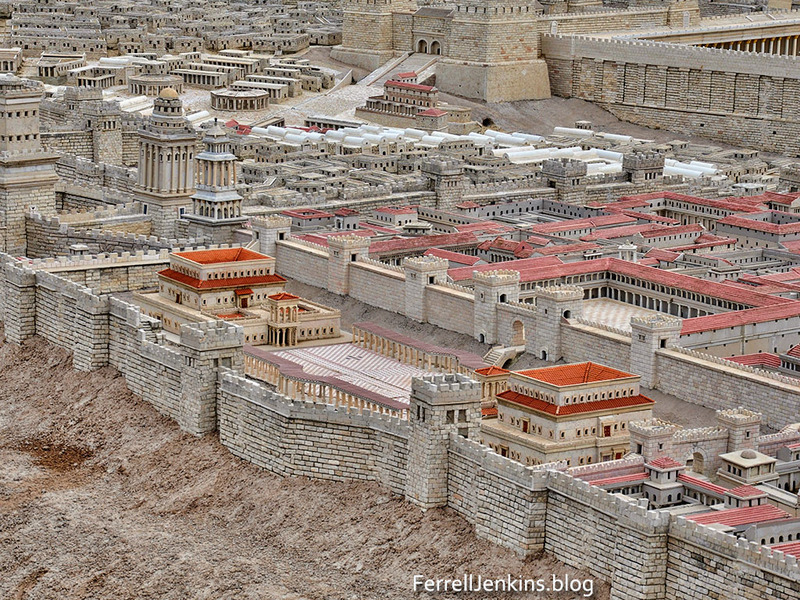 Our next photo shows the citadel and the palace of Herod the Great in the Second Temple model at the Israel Museum. The palace is shown with two buildings and a large courtyard between them. Gibson and others would make that area smaller as a square area. The “Hidden Gate” is approximately where the letter “g” of blog is located. 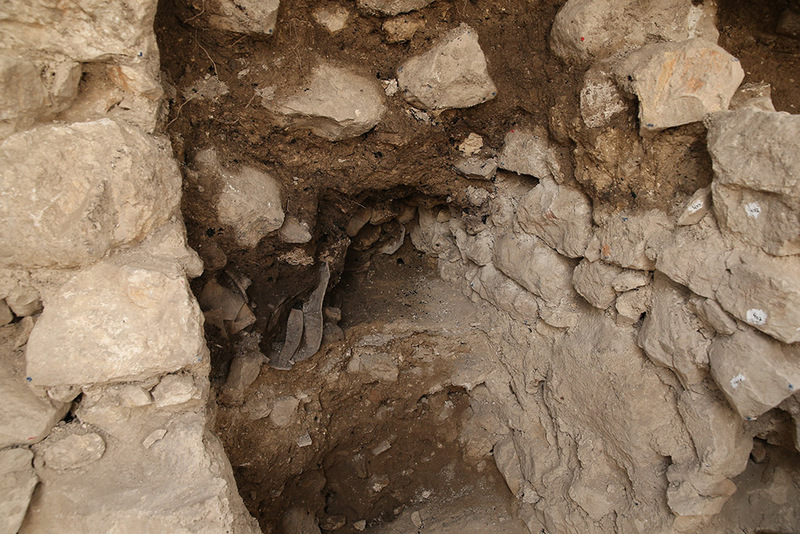 Archaeologists point out that Herod’s palace was not a single building but a complex. The Roman prefect (governor) resided at Caesarea Maritima, but made his residence here when in Jerusalem (Matthew 27:2, 11, et al.). The Herod ruling at the time of the crucifixion was Herod Antipas (Mark 6:21; Luke 3:1; 23:7). He was the son of Herod the Great who was Tetrarch of Galilee from 4 B.C. to A.D. 39. 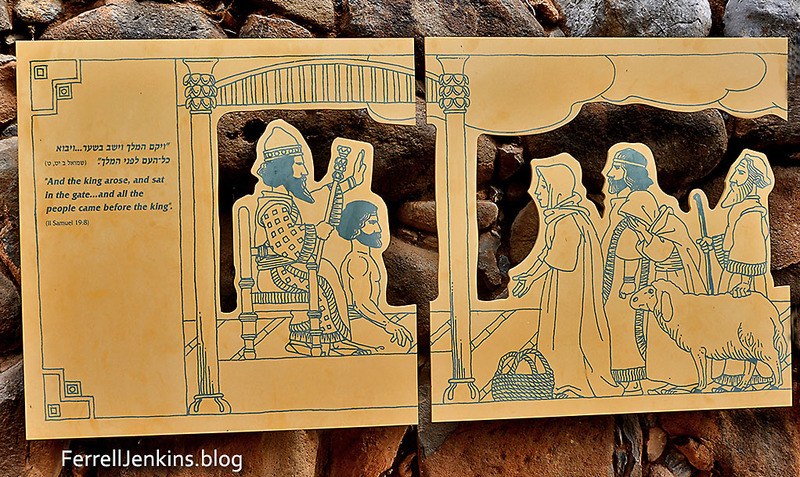 The Gospel account in Luke 23:1-12 agrees with the view that Antipas and Pilate were residing in close proximity to each other. Herod’s palace depicted in the Second Temple Model at the Israel Museum. Photo by Ferrell Jenkins. Balage (Archaeology Illustrated) has graciously allowed us to use his drawing which illustrates the viewpoint of Shimon Gibson. There are problems associated with this location. Would this be a suitable area for a crowd of Jews to gather, and how would Jesus get from here to the place of crucifixion? Gibson suggests that Jesus went back through the Praetorium. 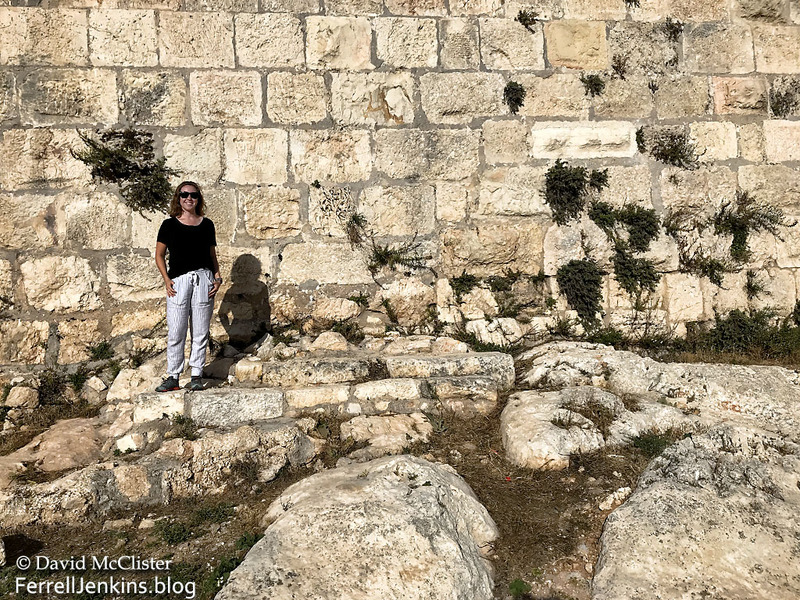 At the current time it would be easy to return to Jaffa gate and continue to Golgotha, but I do not know how easy that would have been in A.D. 33. The site where Jesus stood before Pilate, according to Gibson. Art used by permission of Balage, Archaeology Illustrated. The Gospel of John provides a fairly detailed account of the movement of Pilate when he was responsible for Jesus. John states that the Jews led Jesus from the house of Caiaphas, the priestly ruler, to the governor’s headquarters (18:28). 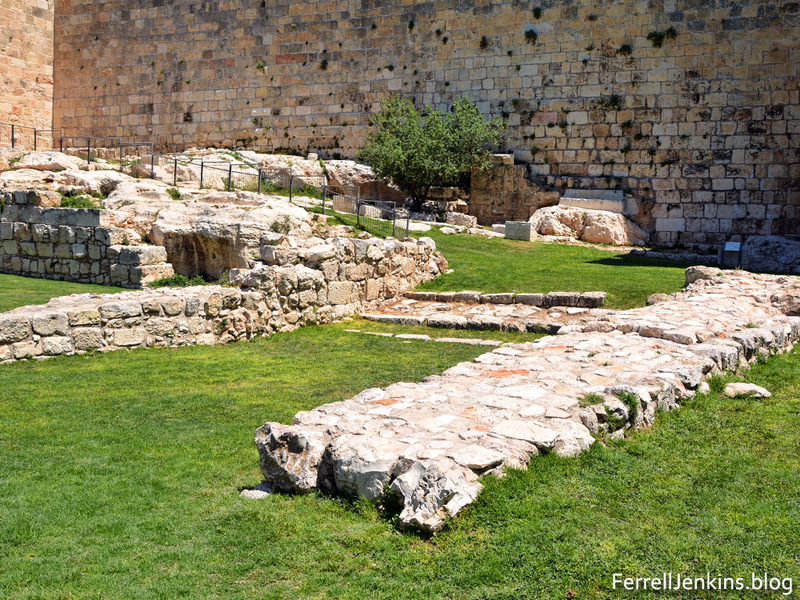 We understand that Pilate stayed in the Palace of Herod when he visited Jerusalem. Since the Jews would not enter the area where the Gentile Prefect was staying, Pilate “went outside to them” (v. 29), then “entered his headquarters again” (v. 33). After questioning Jesus, Pilate “went back outside to the Jews” (v. 38), then he “took Jesus and flogged him” (19:1). I take this to mean that he took Jesus back in. After Jesus was flogged, crowned with thorns, arrayed in a purple robe, and mistreated by the soldiers, Pilate “went out again” (19:4). At this point “Jesus came out, wearing the crown of thorns and the purple robe” (v. 4). Pilate presented Jesus to the Jews with what might have been a scoffing tone: “Behold the man!” (v. 5). When the chief priests and the officers called for the crucifixion of Jesus, and heard the charge that Jesus “made himself the Son of God”, Pilate “entered his headquarters again” (v. 9) and spoke with Jesus. Pilate was unsuccessful in releasing Jesus. When the Jews threatened Pilate with no longer being a friend of Caesar, Pilate “brought Jesus out and sat down on the judgment seat at a place called The Stone Pavement and in Aramaic Gabbatha (v. 13). Further demands for the crucifixion of Jesus prompted Pilate to deliver him over to them (v. 16). Finally, the text says that Jesus “went out, bearing his own cross, to the place called The Place of a Skull, which in Aramaic is called Golgotha. There they crucified him, and with him two others, one on either side, and Jesus between them. (vv. 17-18). Where was the pavement? There was a pavement at this “Hidden Gate”. To the right of the steps that led through the wall you will see a section of paving just above the yellow line I have made. You must recall that the area we have been looking at did not always have this nice manicured look. Much soil and stones had to be removed by the archaeologists as they did their work. To the right of the bedrock steps that led through the outer wall you will see a section of pavement with a yellow line below it. Photo by Ferrell Jenkins. The major sources I used are listed by author. Bahat, D. and M. Broshi. “Excavations in the Armenian Garden.” Jerusalem Revealed: Archaeology in the Holy City. Ed. Yigael Yadin. Jerusalem: Israel Exploration Society, 1968-1974. 55-56. Broshi, Magen and Shimon Gibson. 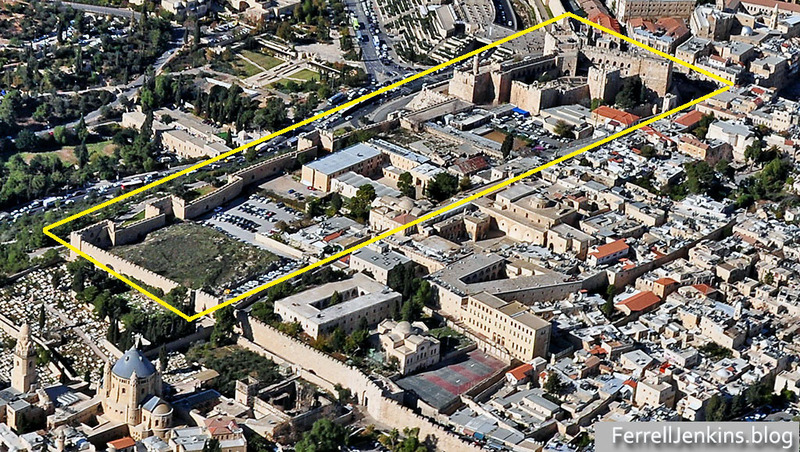 “Excavations Along the Western and Southern Walls of the Old City of Jerusalem.” Ancient Jerusalem Revealed. Ed. Hillel Geva. Jerusalem: Israel Exploration Society, 1994. 147-155. Gisbson, Shimon. The Final Days of Jesus: The Archaeological Evidence. New York: Harper One, 2009. __________. “The Trial of Jesus at the Jerusalem Praetorium: New Archaeological Evidence.” The World of Jesus and the Early Church: Identity and Interpretation in Early Communities of Faith. Ed. C. A. Evans. Peabody: Hendrickson, 2011. 97-118. *This paper is also available on Gibson’s page at Academia.edu. Kramer, Joel, Actor. Praetorium Jerusalem Part 1 with Joel Kramer, You Tube, 2018. Accessed 24 May 2018. *There are several different videos available of Joel Kramer explaining the Praetorium. Kramer, Joel, Actor. Praetorium, You Tube, 2015. Accessed 24 May 2018. 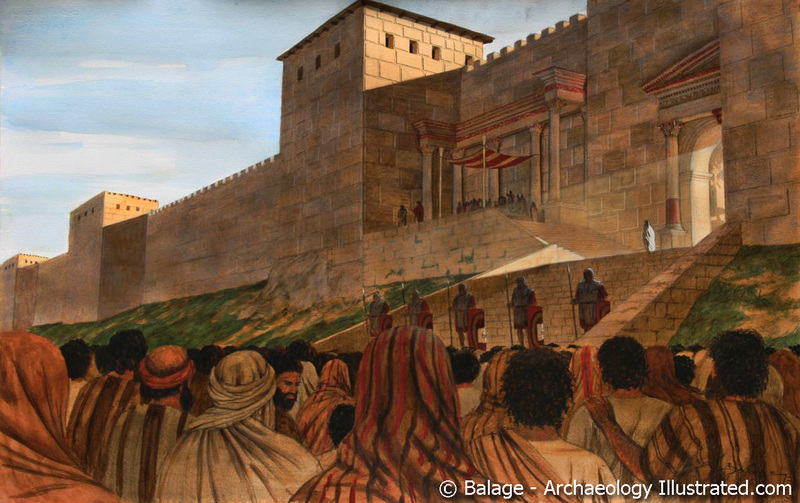 What do you know about Tisha B’Av? Tuesday, August 1, 2017, many of the Jewish people recently will observe Tisha B’Av. This phrase, strange to Christians, means the Fast of the Ninth. The observance “is a day of mourning to commemorate the many tragedies that have befallen the Jewish people” (Judaism 101). According to this source, five terrible events took place on or near the ninth day of the month Av, the fifth month of the Jewish calendar. The most significant of these events are the destruction of the Temple by the Babylonians in 586 B.C. (2 Kings 25:8-9; Jeremiah 52:12-13), and the destruction by the Romans in A.D. 70. In the past half century a considerable amount of evidence has come to light concerning the destruction of Jerusalem by the Babylonians. The temple destroyed in 586 B.C. had been constructed by King Solomon in about 966 B.C. It was rebuilt by those who returned from the Babylonian Exile (530-516 B.C.). In the previous post we published the Israel Antiquities Authority release about additional evidence of the Babylonian destruction of Jerusalem found in the City of David. Take a look at the additional photos there. 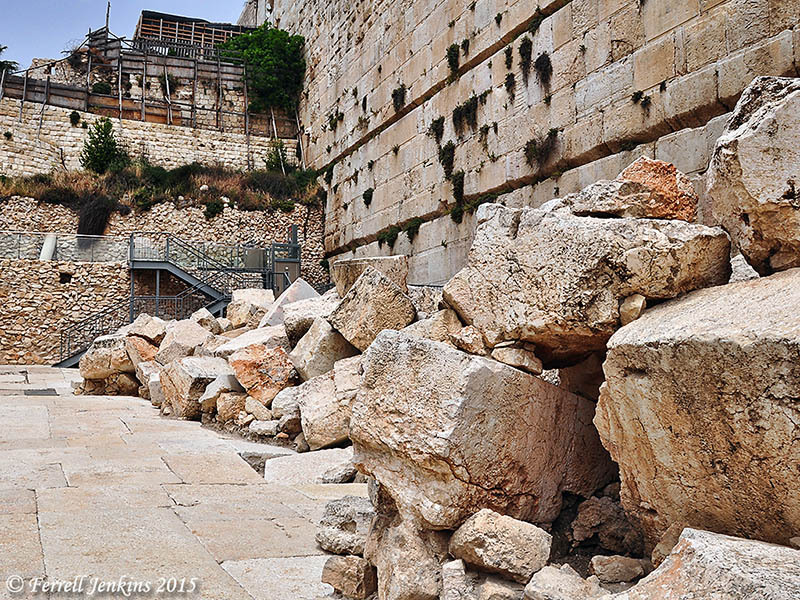 The structure in which shattered jugs were found, attesting to the destruction of Jerusalem by the Babylonians. The darker area near the center of the photo shows the burn level when the city was destroyed. Picture: Eliyahu Yanai, Courtesy of the City of David Archive. Herod the Great began about 19/20 B.C. to rebuild the temple. This work was still in progress during the ministry of Jesus. Christians take seriously the prophecy of Jesus. There is no archaeological evidence of the temple building itself. The site where the temple once stood is now covered with paving stones and the Dome of the Rock which was constructed by the followers of Mohamed in the 7th century A.D. The Dome of the Rock stands where Solomon’s Temple was built. Photo by Ferrell Jenkins. Vivid evidence of the Roman destruction of Jerusalem was discovered at the SW corner of the temple area in the Tyropean Valley. Some of the rubble can still be seen on the street which was probably built by Agrippa II in the 60s of the first century. 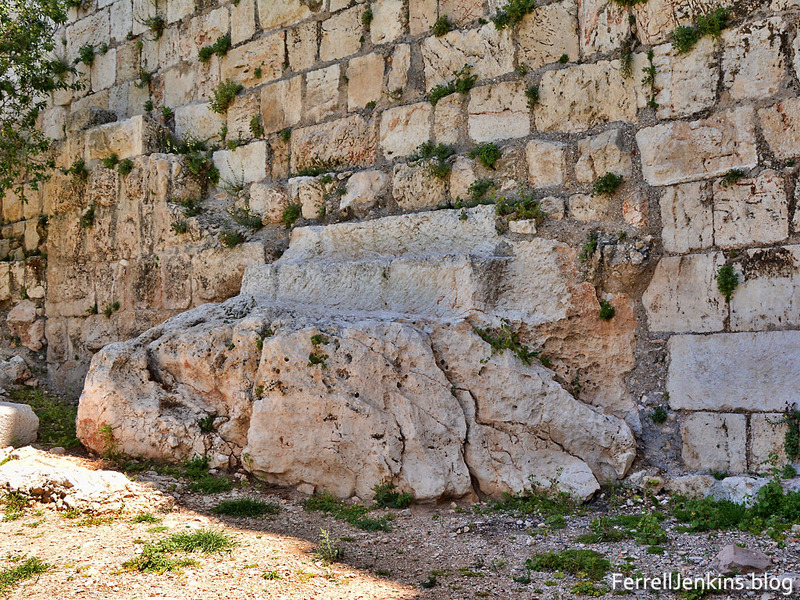 Stones that fell, or were pushed, from the Temple Mount to the street below in A.D. 70 at the time of the destruction by the Romans. Photo by Ferrell Jenkins. Wayne Stiles recently wrote an article here on this topic with several excellent photos from the Burnt House in Jerusalem, a house burned during the Roman destruction in A.D. 70. 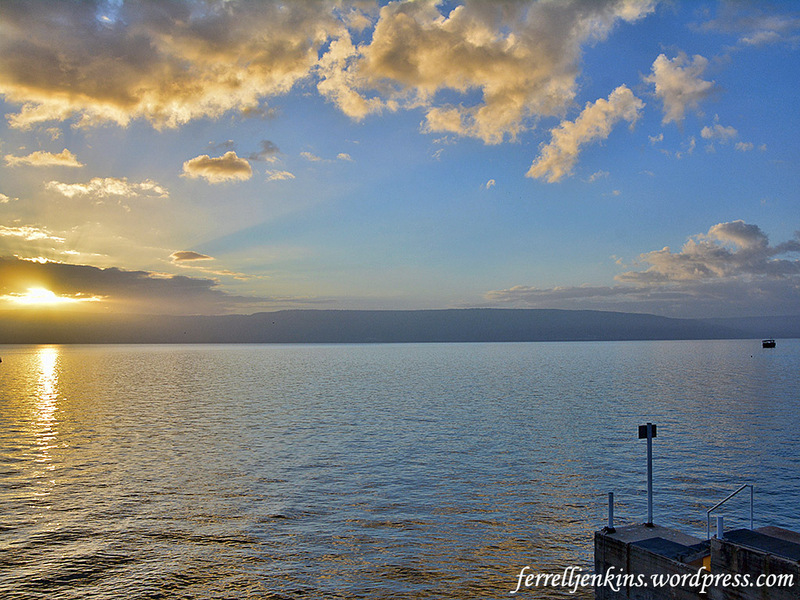 Sunrise on the Sea of Galilee (Lake Kinneret; Sea of Tiberias) evokes many memories of the ministry of Jesus and His disciples. No matter how many photos one takes, each one is unique. I usually make these sunrise photos with two cameras, using multiple settings. The photo today is one that I especially like because I was able to catch the fisherman heading to harbor after a night of fishing. 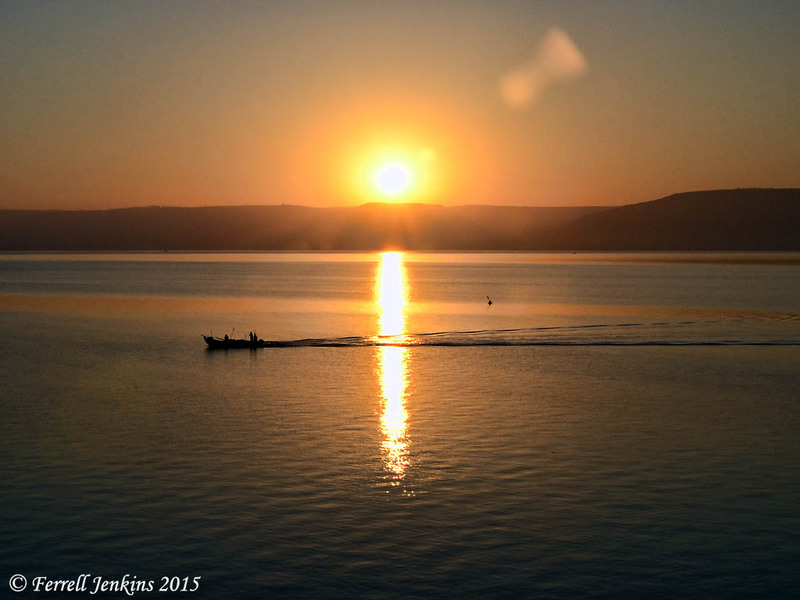 Sunrise on the Sea of Galilee, May 17, 2015, 5:54 a.m. Photo by Ferrell Jenkins. Notice this text detailing the third appearance Jesus made to His disciples after the resurrection. Read the rest of the story and the miraculous catch of fish in John 21:6-14. This post is a repeat from October 21, 2015. Have you seen “Following the Messiah”? Many of our readers have likely seen some of the new videos produced by Appian Media. Following a fundraising campaign a small group, including two professional producers and a cinematographer, visited Israel to film places associated with the ministry of Jesus. Jeremy Dehut, a minister in Alabama, was so impressed with his visit to Israel a few months earlier with Barry Britnell he convinced his brother Craig, Stuart Peck, and Jet Kaiser, to join him and Britnell in this undertaking. These guys are not filming with their iPhone. 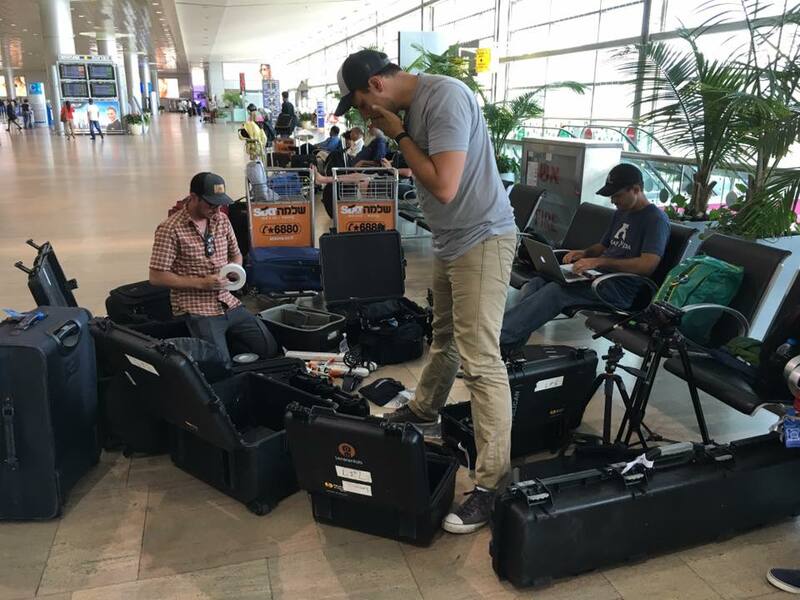 Take a look as they get organized for one of their international flights. When you view some of the videos you will see the quality. The Appian Media film crew gets ready for an international flight. Go to the web page of Appian Media here and take a look at some, or all, of the videos. You may even download them for your own use in teaching. The Appian Media team is engaged in their 2017 fundraising campaign in anticipation of another trip that will concentrate on the final days of Jesus in Jerusalem. The web page explains how you can participate in this effort. Search for @appianmedia on Facebook or in Messenger to find the Appian Media page easily. Appian Media is a 501(c)(3) non-profit organization designed to create FREE quality Biblical video content and other resources and make them available to everyone! Take a look. You will be able to see where many of the events in the earthly ministry of Jesus took place, and your Bible reading will take on a new dimension.